Mint isn’t just mint. There’s peppermint, spearmint, ginger mint, apple mint, pineapple mint, chocolate mint, lime mint and on and on. (Anyone ever seen Best in Show? Yeah, varieties of mint are kinda like the “I can name all the nuts” scene.) Different mints have different levels of super potent compounds that give them their distinctive and cooling flavors. One of the most prominent is menthol. 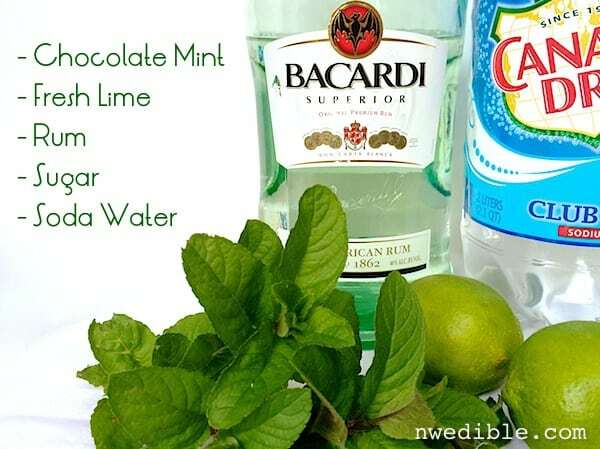 Mojito lovers get in passionate debates about the “right” mint to use in this refreshing Cuban drink. 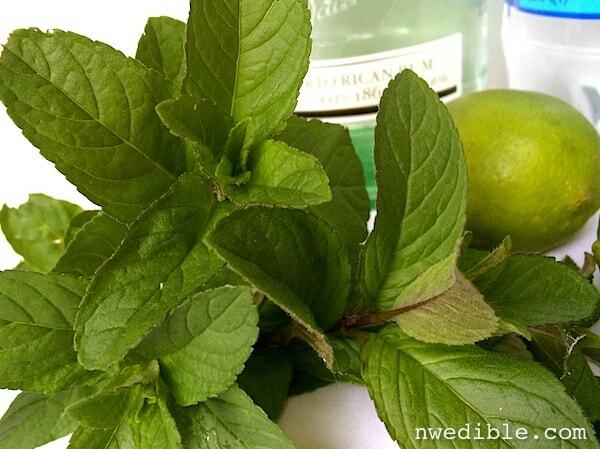 There is even a cultivar of spearmint mint called “Mojito” that is supposedly the best for the eponymous cocktail. The truth is, a good mojito can be made with many different kinds of mint, but each will give a different result based on the flavor compounds in mint. 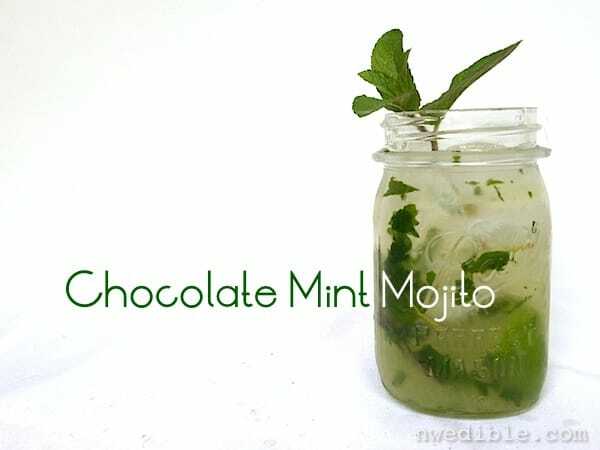 Many people, including me, will prefer the more gentle flavor of spearmint over the more assertive peppermint in this drink, but lately I’ve been playing around with Chocolate Mint (a peppermint variety) with dangerously delicious results. Chocolate Mint (below) is a dark green mint with a more rounded leaf than you typically see on spearmint. The best way to have some is to grow it. 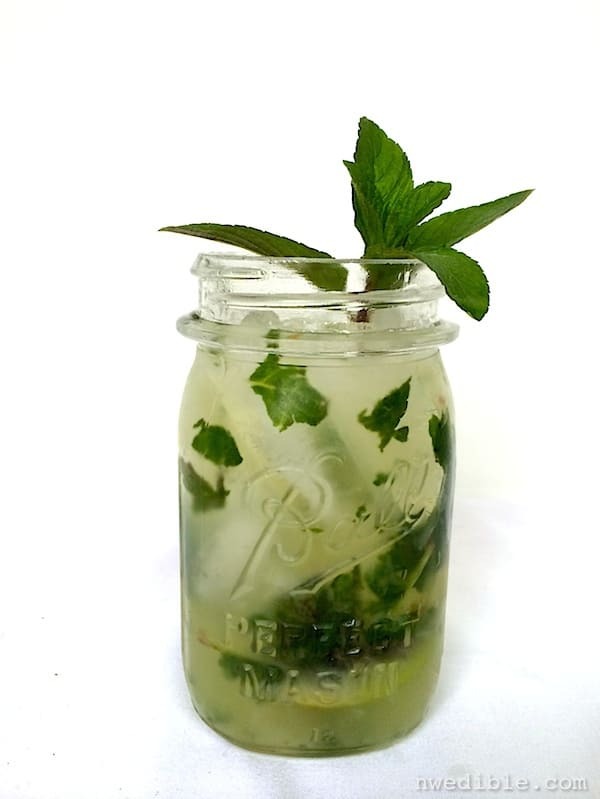 If you are limited to grocery store mint offerings you will likely be buying spearmint, which also makes a perfectly lovely drink as long as it’s fresh, sweet and flavorful. Because the flavor of mint can be so variable, I try to discreetly pop a small piece of leaf in my mouth and sample the flavor before buying ready-to-use mint at the grocers or cuttings from the nursery. 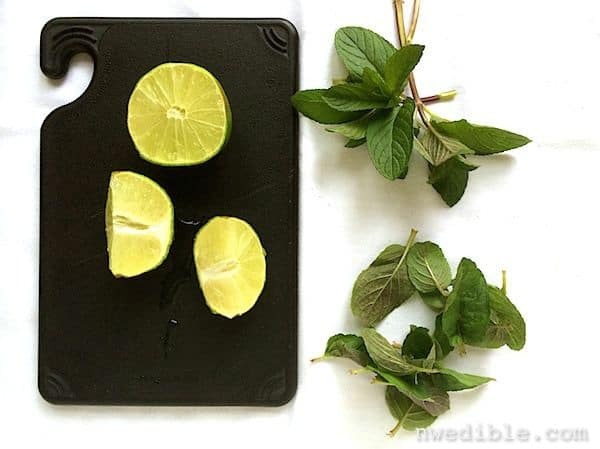 Cut your fresh lime into quarters and pick off 8 or 10 nice looking leaves from your mint sprigs and tear them up a little bit. Leave the tip of the sprig intact to garnish if desired. 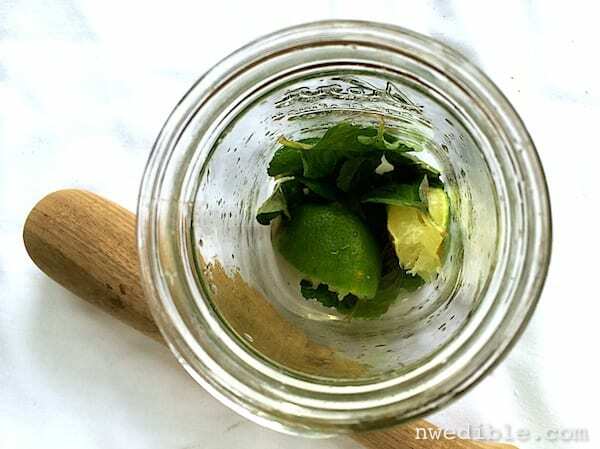 In a pint-sized mason jar, squeeze the juice of two wedges of lime (one-half of a lime total) into the jar, then drop the lime wedges into the bottom of the jar. Add the mint leaves and either two teaspoons of superfine sugar or one tablespoon of simple syrup, depending on what you have. Muddle the lime, mint and sugar, and make sure the sugar is fully dissolved before proceeding. Add 2 oz. white rum and enough cracked ice to fill your mason jar. Give the drink a good muddle to mix the ingredients right in the jar, then top the drink with a heavy splash of club soda – about 2 oz. Garnish with the tip of the mint sprig and serve right away. Forget the little lemonade stand this summer. I’m sending the kids to the front lawn selling these instead! But maybe I should have them charge 50 cents a cup instead of the usual 25 (or free). Loving this chocolate mint and lime dream team duo! Ooh! This sounds like such a great plan for a hot weekend. I tend to make mojitos with the wild mint in our side bed–definitely a spearmint shape, but other than that I haven’t been able to narrow it down. This weekend I’m totally going for a rhubarb mojito with rhubarb simple syrup, because I can. But now I want to get my hands on some chocolate mint too! Chocolate mint also makes great home-made thin mint cookies, mint lemonade, and mint tea. But we still have to pull it out by the armful and compost because we made the mistake of putting it directly in our herb garden and no amount of mojitos can keep it from taking over. Lesson learned: always plant mint in a container. Seattleites in the south end can find chocolate mint (and spearmint and orange mint) at Carpinitos Nursery in Kent. I love the smell of chocolate mint, it smells just like those Andes mints! I’m a fan of the chocolate mint. I’ve never had it in a mojito, but I find it makes a brilliant iced tea when you mix it with hibiscus or rosehips or some other acidic, red tea (maybe it would work with sumac?) They’re a good combination for a non-alcoholic summer beverage. I kind of want to try it with cranberry juice to see how it does there. Well thanks to you my herb garden has now swelled by 3 more varieties of mint. Can’t find chocolate anywhere but the lime looks to have potential. My favourite eau-de-cologne mint, though I haven’t tried it in anything edible. I’m quite happy to just sniff it, though I do sometimes put it in the bath. These might be the first mojitos I like! Can’t wait to try them.